Типичный извержения стиль: Dominantly explosive, with effusive activity during intervals. Powerful explosive, so-called Plinian eruptions appear to occur every 10-30,000 years. Construction of lava shields and minor to irregularly spaced subplinian explosive activity during interval times. Santorini's volcanic activity during the past 2-500,000 years has been dominated by very large explosive eruptions at intervals of few tens of thousands of years. The most recent of this type occurred at around 1613 BC and is known as the so-called Minoan eruption. The late Bronze Age eruption, one of the biggest known volcanic explosions in younger time,- and one of the most studied, but still most mysterious eruptions of all time-, devastated not only Santorini, but had a deep impact on the whole of the Eastern Mediterranean. Perhaps it even had serious world-wide effects and changed history. Still today, one can see its deposits, the characteristic, tens of meters thick layer of white pumice and ash that blankets most of the surface of the island group. The eruption changed the shape of the island itself dramatically: it is now believed that before the eruption, it had the shape of an almost complete ring that enclosed an earlier, shallower caldera. Then, large sections of island collapsed into the emptied magma chamber after the eruption, literally disappearing under the sea. The ring-island was breached to the W and NW, and the caldera was significantly widened and deepened. The Minoan eruption devastated the rich, highly developed economic center, that Santorini was at that time. Since 1969, intense archaeological excavations have brought to light an important Cycladic/Minoan town which had been buried beneath the volcanic ash for almost 4000 years. Although it appears that people had time to evacuate their island in time before the eruption, carrying most of their goods with them, the findings from Akrotiri are impressive: especially, they include well-preserved and magnificent wall paintings, ceramics and other objects. Thanks to the work of numerous archaeologists, a new light was thrown on an important prehistoric period and culture. The spectacular discovery even induced continuing speculations that relate the volcanic destruction of Santorini to the legend of the sunken Atlantis. 10. Jan. 1950 - 2. Feb. 1950: Small effusive activity ("Liatsikas" lavas) preceded by phreatic explosions. 20. Aug. 1939 - July 1941 -- Formation of several lava domes ("Tritona", "Ktenas", "Fouqué", "Smith-Reck" and "Niki"). Extrusive and slighly explosive activity. Lava outflow in most cases preceeded by phreatic explosions. 11. Aug. 1925- 17. March 1928 -- Moderate effusive and explosive activity. Growth of Nea Kameni. Lava flows, lava fountains and ash-falls. No volcanic activity occurred during 1711-1866. Mikri and Nea Kameni were 2 separated islands forming 2 natural bays (Georgios and Vulkano bay). Sulfuric fumaroles in Vulkano bay. Building of a small harbor and ca. 50 summerhouses (!) on Nea Kameni. 27. Sept 1650 -- Kolumbo submarine volcano (ca. 8 km NE of Cape Kolumbo, Santorini): strong surtseyan-subplinian eruption with ash and pumice fall, toxic gasses (>50 fatalities). Generation of a strong tsunami. Formation of Mikri Kameni (gr., = "small burnt island"). 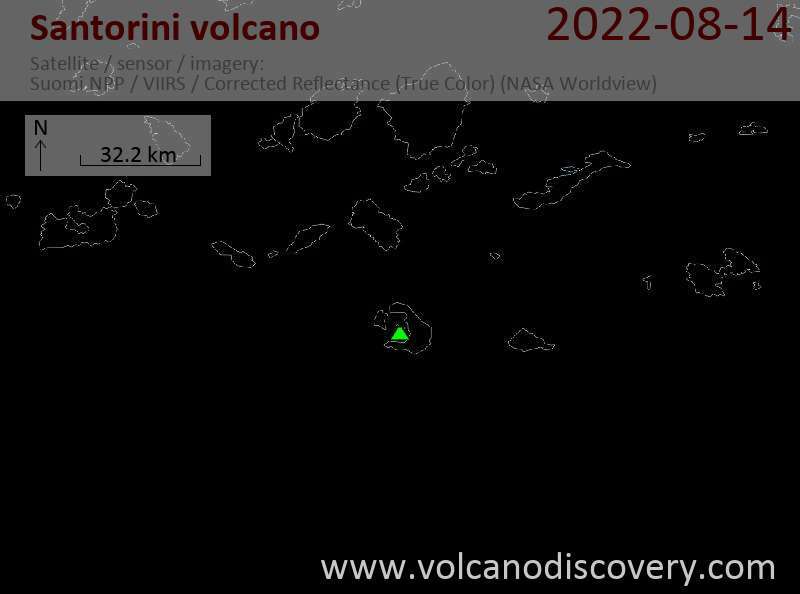 Surtseyan activity, ash-fall and block fall-out accompany the formation of a lava dome which rises above sea level to form the new island Mikri Kameni. Unclear reports from Athanasius Kircher (1665) and Buondelmonte (1465/66) indicate that either a part of Palea Kameni collapsed and disappeared or a new island between Palea Kameni and Thera was built. Strong explosive probably sub-plinian eruption. Records by Nicephoros (758-823), Theophanes (752-818) and Cedremus (after 1059). Probably small effusive activity following the pumice eruption creating the black blocky lava lobe at Agios Nikolaos (the small harbor bay with the church and hot iron springs). No reports of activity are known from that period. There was either actually no eruption or it has not been recorded. Appearance of a new island that probably grew together with Hiera and formed the basis of Palea Kameni. Descriptions by Roman historians Seneca (4 BC-65 AD), Livy (59 BC-AD 17), Pliny the Elder (23-79 AD), Dio Cassius (ca. 200 AD), Aurelius Victor (4th century AD), Philostratos (ca. 200 AD), Orosius (5th century AD), Cassiodorus. (418-562 AD), Labbreus (1670). Probably surtseyan activity with updoming of the sea-floor. Formation of an island called Hiera (gr., = "the holy one") inside the caldera, probably a precursor of Palea Kameni. Documented by greek and Roman writers: Strabo (66BC - 24 AD), Plutarch (ca. 40-120 AD), Pausanias (ca.120 AD), Justinus (2nd century AD), Eusebius from Cesarea (270-340 AD) and Ammianus Marcellinus (ca. 330-400 AD). Probably surtseyan activity with updoming of the sea-floor (comparable with the 1707-1711 events). The most recent plinian eruption on Santorini occurred in the late Bronze Age at around 1613 BC and is known as the so-called Minoan eruption. It is one the biggest known volcanic explosions in younger time,- and one of the most studied, but still most mysterious eruptions of all time-. It devastated not only Santorini, but had a deep impact on the whole of the Eastern Mediterranean. Perhaps it even had serious world-wide effects and changed history. Still today, one can see its deposits, the characteristic, tens of meters thick layer of white pumice and ash that blankets most of the surface of the island group. The eruption changed the shape of the island itself dramatically: it is now believed that before the eruption, it had the shape of an almost complete ring that enclosed an earlier, shallower caldera. Large sections of island collapsed into the emptied magma chamber after the eruption, literally disappearing under the sea. The ring-island was breached to the W and NW, and the caldera was significantly widened and deepened. Tom's private website about Santorini, Etna and other volcanoes. Contains a huge archive of volcano photos, information and other stuff.